0.4" of snow weight in at 0.03" of liquid. 13:1 ratios. Current temperature of 28.4°F. Maybe an inch and a half. Solid inch here. Still snowing very lightly. Brings my total to 1.3 for the season. Ended up with almost an inch in Smyrna, DE. The last two storms have been very nice to this area! Ended up with a little under an inch here in Denver, PA. Schools had a 2 hour delay. Ended with just under an inch. Dusting, can't be measured by normal rulers. Picked up an inch here just northeast of Baltimore. I’m guessing the NAM model handled this little event the best as at least for around here several of the other models had my area going over to rain with hardly any accumulation what so ever, however the NAM for days was the model that had an all snow event for the B-More region. If I got a dusting, it melted overnight. When I drove home from work around 7:15 it was snowing hard, 1/2 mile visibility on the interstate but only wet pavement. Hit the bed hard by 8:00 PM. Woke at 5:30 AM to find out we had a 2 hour school delay. Didn't see any new snow left on the truck at 8:00 when I headed out to get to school early to redo the plan for the day because of shorter classes. No issues or slick spots on roads, but I assume the road inspection crew must have found a couple dicey spots on bus routes. Overperformance, if I can call no accumulation that, seems to be the pattern within the pattern so far this winter. Places that do get precip, seem to get more than forecast, and more places than expected seem to get in on the action. Wonder what that means going forward for this weekend? Not expected to see accumulating snow here in my part of VIrginia, but the much hyped "flash freeze" - which is a literal physical impossibility - might have more water on the roadways to impact as temps crash Sunday afternoon and overnight into a very cold Monday. That makes me wonder if Tuesday morning won't be another school delay as they wait for the temps to warm enough for the road salt and chemicals to work again. Been following them for a few year now, but only get pics once or twice a year. often the sun is behind them and i am blinded. I wonder if it's on purpose so their prey cannot detect them I notice same trait with hawks. This beats every grill cover on deck snow photo ever. Thanks for sharing this most fascinating OBS. This guy in Richmond, VA was not messing around. About the same here, at least there was no change over or mix. I'm going to go out on a limb and say the cons outweigh the pros in this scenario. 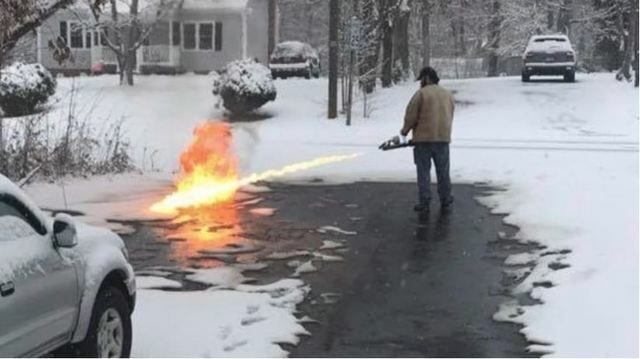 Just drive over your two inches of snow flamethrower guy. Congratulations!! You got your 300 flakes!! @MaineJay getting some snow now? Very light, but enough to hide the ice so that I took a digger on some. OBS: Temp at 24F with a DP of 18F with light snow. We've had light snow on and off all day. Tonight we may have accumulated 1/4 of an inch. Our snow pack (about 6") should be nice and white for the new storm. I had a little bit over a half inch of snow yesterday that melted away the same day.